Don’t want to step outside due to chilly weather outside? You all might have experienced cold hands and feet during frosty winters. There’s no worse feeling than shivering and cold feet in freezing temperatures even if you are staying indoors. This happens due to the body’s mechanism of allowing more blood flow to the vital organs for maintaining the body temperature in cold times making your feet cold. Don’t worry! We have a solution to keep your feet and toes warm with a pair of heated socks. Feel free to step outside in icy weather and fight the cold by wearing the best-heated socks. As your feet are the far away from the heart, it takes time to pump blood resulting in cold feet. So, you need to take extra care of your feet by wearing a pair of socks in winters. Also, an ordinary socks pair might not help completely to warm your feet and this is where heated socks come to the rescue. As a result, these types of socks are designed in such a way that doesn’t let cold get in and warm air is entrapped inside. Furthermore, heated socks work with the help of a rechargeable or external batteries (AA and AAA) providing you heating for extended hours. In fact, some also come with simple thermal heating insoles. Heated socks ensure a good blood circulation to your feet. 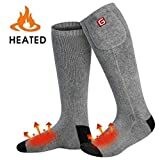 Before you step into the market for buying a pair of heated socks, there are few things you need to know and consider. 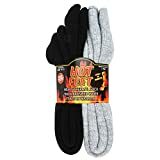 Also, choosing best-heated socks is not an easy task; there are many different types and qualities available in the market. In fact, our buying guide will help you select the best-heated socks that perfectly fit your needs. All these are mixed in different proportions to make the warmest socks possible. In addition, these fabrics are itch-free and have thermo-regulating properties that maintain the heated temperature. Moreover, to retain the perfect shape of the socks, materials like spandex and Lycra are used. Heated socks should be comfortable to wear without any sweat that makes your feet wet. Also, to avoid sweaty feet, silk, polyester, acrylic and polypropylene blends are used with wool as they act as a natural insulator by avoiding moisture while keeping feet comfortable and dry. Cotton material is not recommended as it absorbs much moisture resulting in more sweat. The next thing is to know where and for which purpose you want to use. 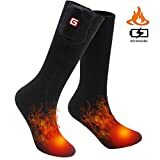 There are different varieties of heated socks for different purposes like running, hiking, athletic sports, camping, skiing, and casual use. In fact, some are designed for indoor medical usage to get warm feet in diseases like hypothyroidism, diabetes, etc. For medical usage, these heated socks use the FTIR technology and have a time limit feature that prevents burn risks. They also improve your sleep during the winter months. For outdoor use, it’s better to go for electric socks for activities like cycling, hiking, fishing, as well as others. Battery and battery life is something you can’t ignore when it comes to electric socks. There are many different of heated socks for you to pick. Some socks run on external batteries that you can charge separately and insert in the battery area in socks. You can use these as ordinary socks as well without the batteries. The next type is the rechargeable battery heated socks using AA or AAA batteries that you can charge with a power cord adapter. Furthermore, these are very convenient for longer outdoor winter trips. The heated insoles are also available which you have to insert them in shoes to get warmer feet with 10 hours of battery life. Warm insulated socks are also a very common type that traps the warm air inside. The last type is microwaveable socks which you can heat in a microwave to keep your feet tepid. Temperature control is a very important factor to consider avoiding any risks of burning feet. Look for electric socks that come with adjustable temperature controlled settings. Controlling the temperature also affects the battery timings. Setting at low heat temperature extends the battery life. The rechargeable socks battery life is about 3 to 10 hours depending on the temperature control. The maximum battery life is 10 hours when the lowest temperature is set in all types of heated socks that runs on batteries. 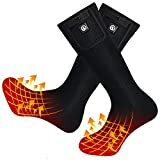 This smart pair of heated socks by the Lenz products is something definitely need during the cold winter months. It runs on 1200 rcB Lithium rechargeable battery that charges with a USB 100-240V charger. 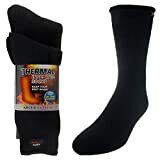 Also, this unisex pair of socks include a blend of polyester, polyamide, merino wool, polypropylene, and elastane making it very light-weight weighing 1.1 pounds only. Furthermore, these are very comfortable to wear with padding and ring bandages. Also, the heated socks are best for sports and outdoor activities during winters with the battery timings of 14 hours. Warm your feet with an advanced way by using a Smartphone to control 3 temperature settings via Bluetooth. Keep these footwarmer insoles by Hotronic in your boots to get warmer feet in no time. These boot warmers measure 15 x 9 x 2 inches and weigh 1.6 pounds. In addition, it runs on S4 batteries that come in the package. Furthermore, it offers 4 heat settings and an extra heat blast temperature control option. So, warm your feet with the power of two heating elements. All in all, make your winter experience more enjoyable, warm and cozy with the benefits of heated socks. So, you can now enjoy all outdoor activities, sports, and camping in the cold icy weather outside. Thanks to heated socks!